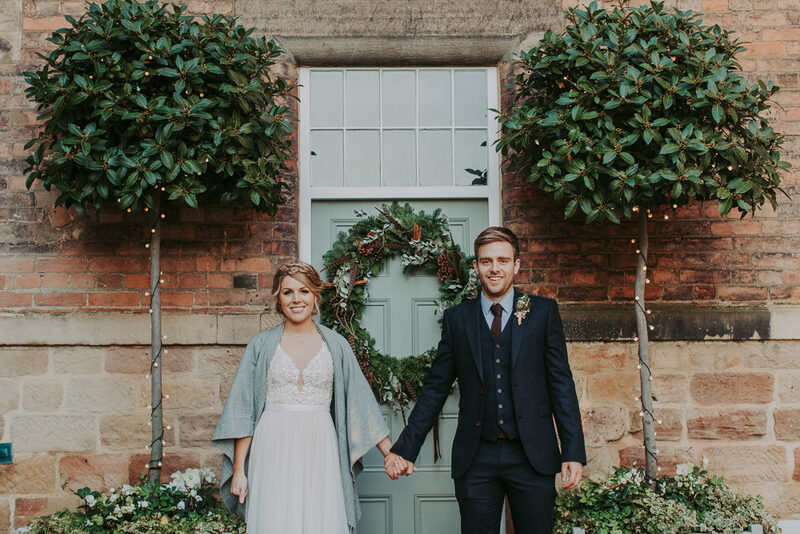 A little festive cheer for us all this cold lunchtime – in the form of Charlotte and James’ cosy winter wedding at The West Mill Derby. 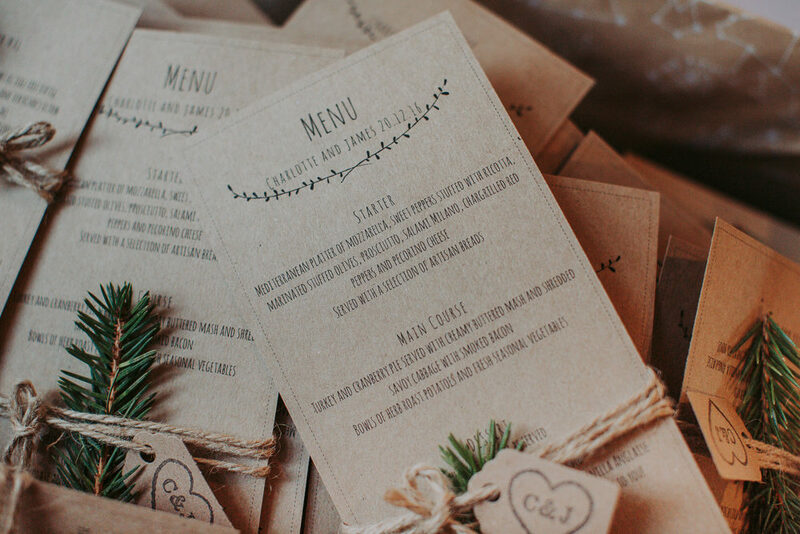 We always love a stylish winter wedding, there’s no need to go hard on the tinsel just because your wedding coincides with Christmas. 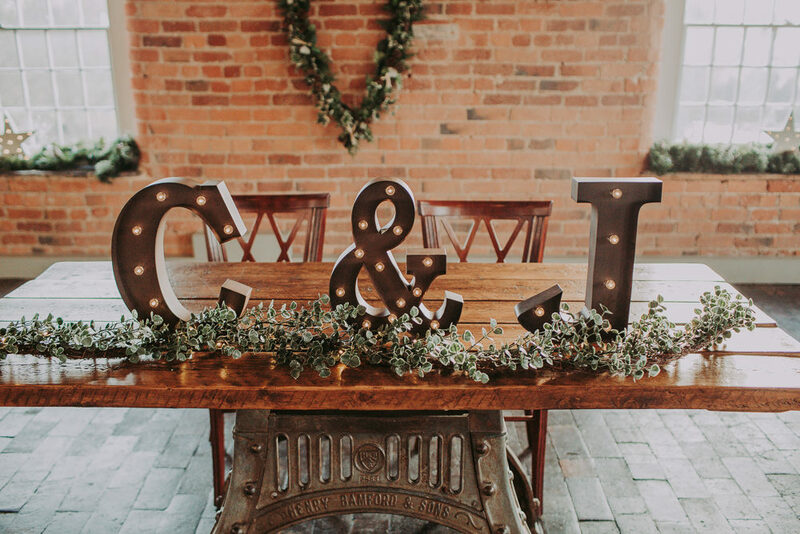 Foliage, sparkly lights and an elegant wreathe are all you need. Charlotte the Bride: A bit of a rollercoaster! I had the most fantastic time trying on dresses and really liked a few of them. I ended up choosing an Essence of Australia dress because it was the one I had liked the most. But I never had THE feeling about it. As the wedding drew closer, doubts started to creep in, I turned to the ever-trusty Pinterest and realised that my heart lay with Watters. With only 4 months until the big day, Charlotte at Emma Elizabeth Bridal in Twickenham was fantastic as I swanned around the boutique in every Wtoo by Watters dress they had! I fell head over heels in love with Marnie by Wtoo; the rose gold underskirt, illusion neckline, lace back and layers of tulle were what my wedding dress dreams were made of! 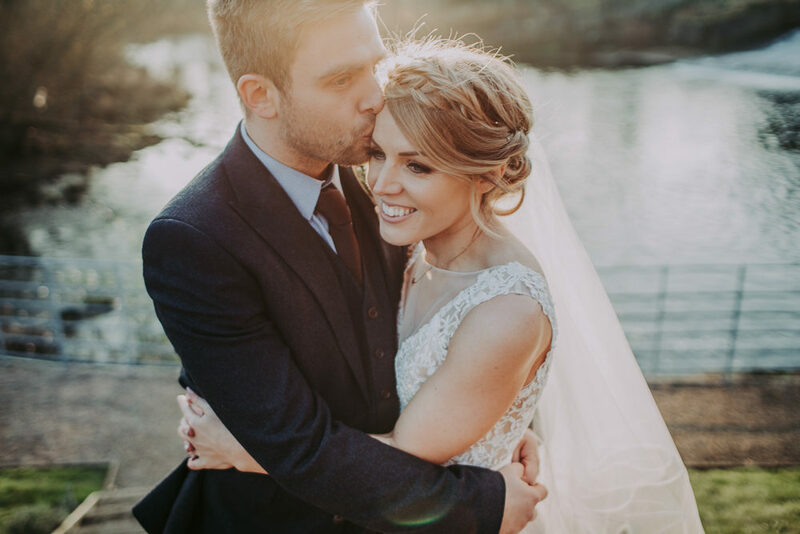 It suited the romantic, relaxed hair I knew I wanted and was perfect for our winter wedding. My shoes were Kurt Geiger and lasted until about 10pm, when I changed into my slippers! 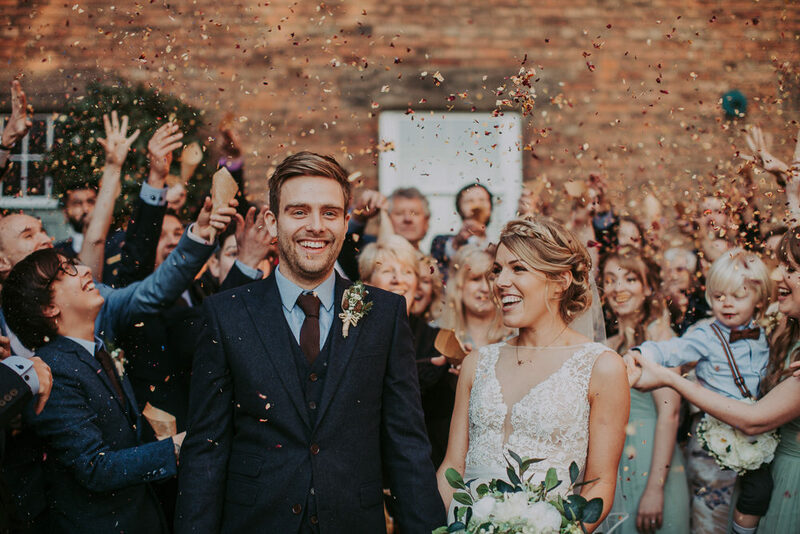 James, his best man and groomsmen wore suits from Next in a navy wool blend; perfect for December. Their knitted mahogany ties were an internet bargain and their suede brown shoes were from Clarks! 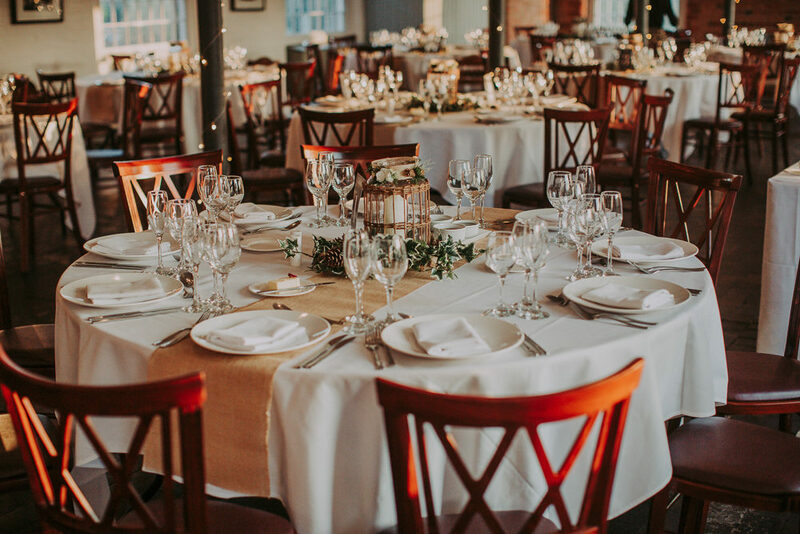 Having been to a lot of weddings at converted barn venues, we loved the idea of somewhere rustic and renovated, but wanted something just a bit different: enter The West Mill! 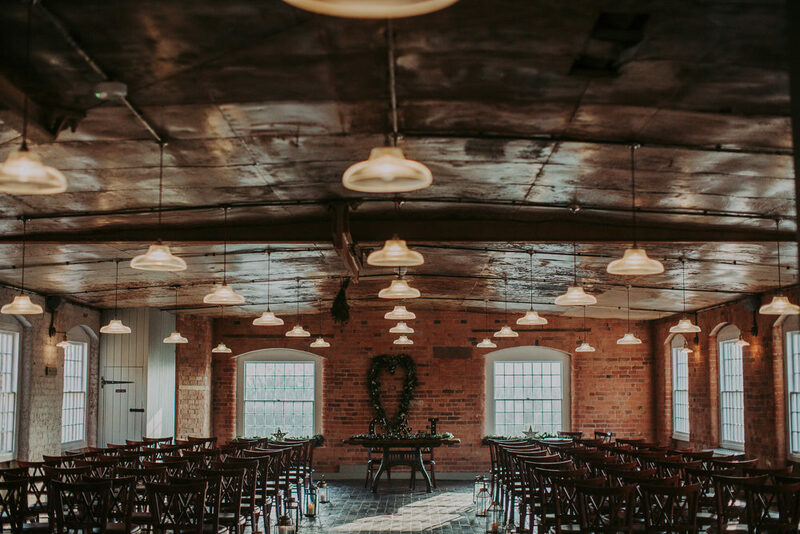 Grade 1 listed, steel pillars, original features, and a whole floor for each part of our wedding day. 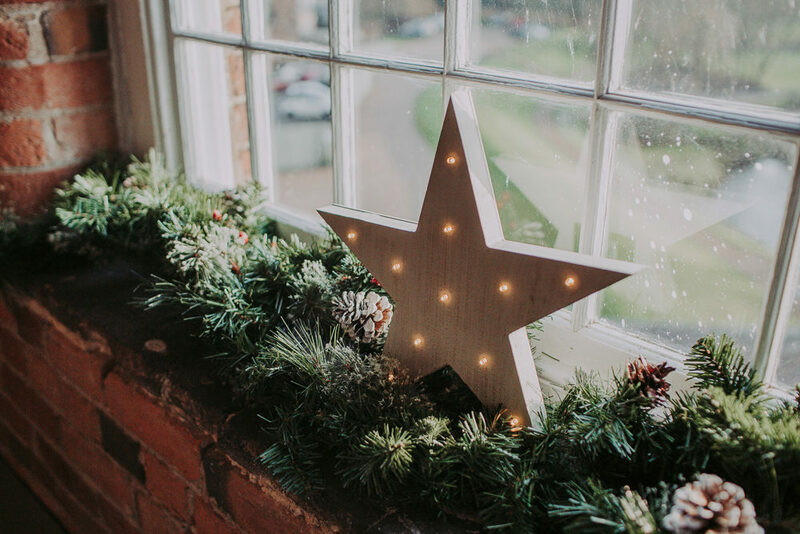 The amount of indoor space made it perfect for the winter wedding we had planned, where we certainly couldn’t rely on December weather (which turned out to be the most beautiful, crisp day with a gorgeous low sunlight!) 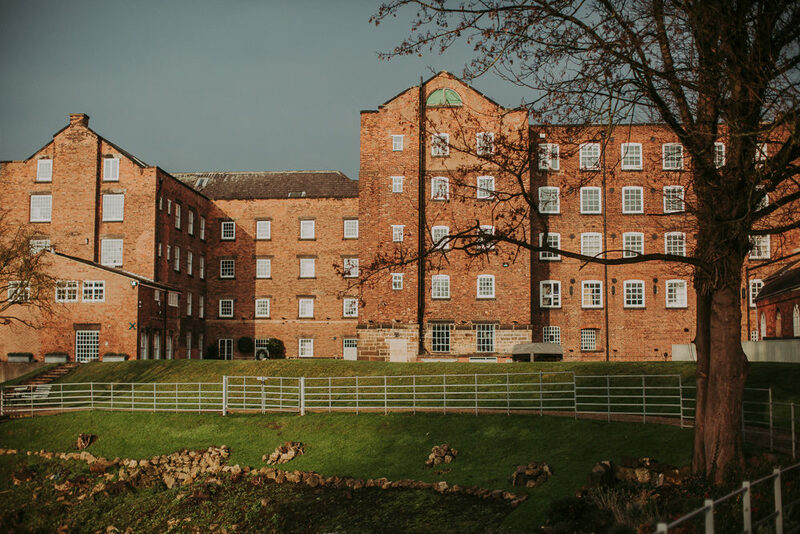 The team at The West Mill were so efficient, knowledgeable and accommodating, we would choose the same venue 100 times over. We didn’t want to be tied to anything too specific colour-wise, just lovely subtle winter colours; greys, pale sage green, white. 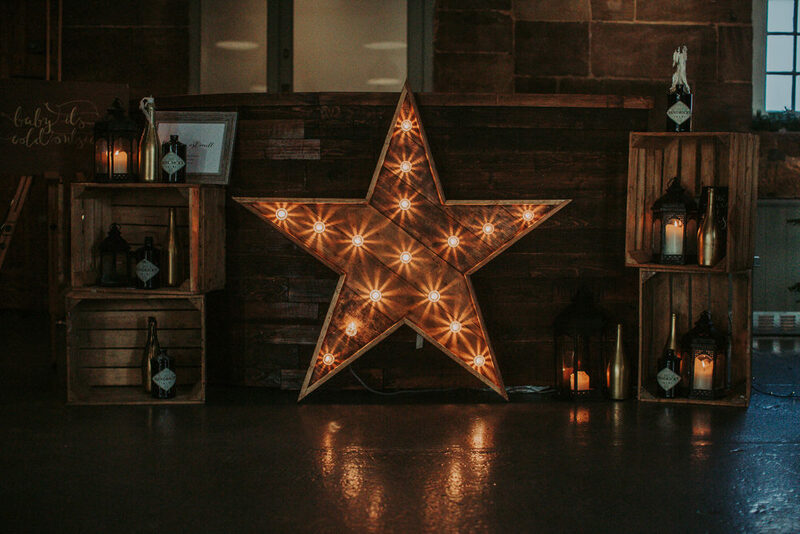 The West Mill had some lovely décor already, available for us to use, so we followed their lead and added more fairy lights, rustic wooden stars, rusty marquee letters, chalkboard signage in vintage frames, and a painted wooden cart with tin buckets and wooden crates to display all our drinks on. Having a florist in the family was very useful! The Groom’s aunty is an experienced florist and had some great ideas of her own as well as executing the suggestions we had perfectly. 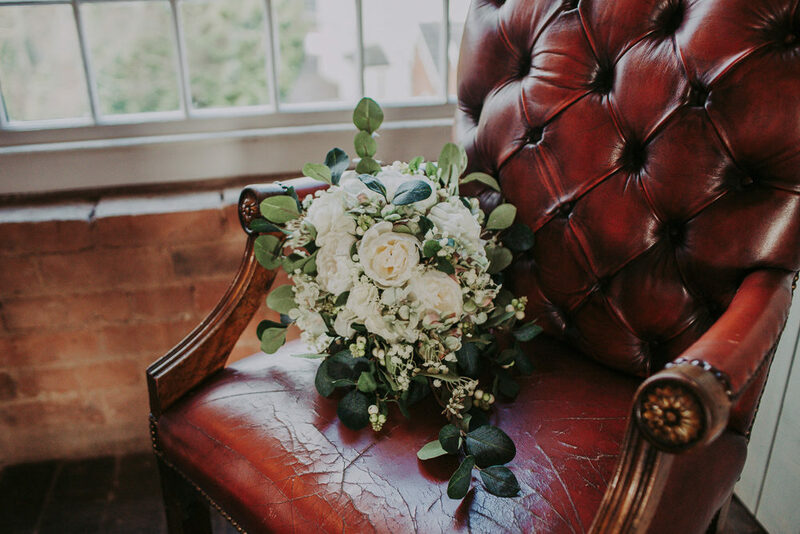 We took inspiration from the time of year and stuck to lots of greenery, foliage plus white peonies and hydrangeas. All of the flowers were artificial, which was really practical and means I can keep my bouquet forever! The best man and groomsmen all wore the same suit as the Groom himself. Our two bridesmaids, our sisters, wore Dessy dresses in celadon green; a beautiful, soft, sage green. I picked the colour, and then let them choose whichever style of dress they liked the most so they would feel comfortable and happy in what they wore. Our two year old son, Henry, was our page boy, dressed in tweed trousers from Zara, a blue linen shirt with braces from Next and a gorgeous little bow tie from Etsy. Our niece Sarah was our flower girl and looked like the perfect princess in a pale grey tutu from Etsy and a white leotard and ballet tights from a dancewear shop. I was really jealous of her patent grey Mary Jane shoes – they don’t go up to adult sizes! Our four year old cockapoo Tilly wore a bargain flower crown around her neck that I bought on eBay. We didn’t expect it to be, but it was our absolute favourite part of the day! The anticipation before it began, seeing all our favourite people in the same place for the first time, exchanging the vows we had written ourselves and walking back down that aisle feeling so full of love as husband and wife. Amazing! I forgot to wear my veil, but was too high on life to care! For the benefit of our own toddler and other children there, we had a kids tepee set up with toys and books. For the grown-ups, my friend Jessie Ruff sang a few songs we had chosen during the reception drinks. Our guests couldn’t believe that her day job is as a teacher and not a professional singer! In the evening, we wanted a very relaxed feel to the reception so brought in our own football table to the bar area and asked one of the groomsmen (who happens to work as a producer for Capital FM) to DJ for us. Jenkinsons, the caterers at The West Mill, were fantastic and so flexible with whatever we asked for! We put out sharing platters of olives, artisan breads, cheese and prosciutto ham for our starter, gave a little nod to the time of year with a turkey and cranberry pie for the main course and let people swap and share amongst themselves for dessert, giving a mixture of white chocolate brioche pudding and toffee apple crème brulee. Even with my wedding dress on, I managed all three course and they were amazing! Emma from Hellocake in Derby helped us create our four tiered wedding cake. People still talk about the sticky toffee flavoured layer! We chose local sausages with caramelised onions in finger rolls, and curry and rice bowls for our evening food – but were both too full from dinner to try any of it! Our evening guests have assured us it was delicious though. I still look at our wedding photos most days. 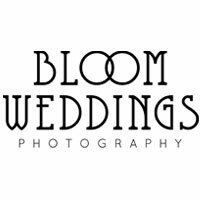 The job that Bloom Photography did was just perfect. We wanted natural photos, capturing the little moments as well as the big and they did just that and more! Chris and Anii had amazing ideas and were a pleasure to have capturing our wedding. Camera Hannah: what a woman! Her videos are unreal! We weren’t going to have a videographer as many of the wedding videos I had seen were long, drawn out and I knew I would cringe at hearing myself read out my vows. Then I saw the highlights video that Hannah created for my sister and brother-in-laws wedding 4 months before ours and there was no question: she had to be there at our wedding! A creative, talented lady with an eye for the most lovely special moments that others might miss. I show our wedding video to anyone who’ll watch!